Bead & Button magazine, Issue 130, December 2015, Page 72. The first one was made using the ever popular Bronze 457, with Turquoise SuperDuos as per the B&B Project. 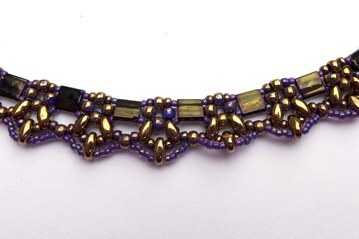 Seed beads – 8-1701 & 11-1701 Marbled Purple Gold, plus 15-384 Colour Lined Grape Purple. Gunmetal Ball and Socket Clasp. 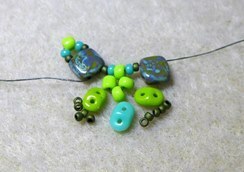 Keep threading the Tila beads in the same direction as they have a smooth side and a side with a “lump”. Make sure you check the holes in your SuperDuo beads as sometimes there is one blocked hole and it is frustrating to have to unpick and remove the faulty bead. Opaque Olive size 8/0s, 11-412 Opaque Turquoise and 15-617 Matt Olive. 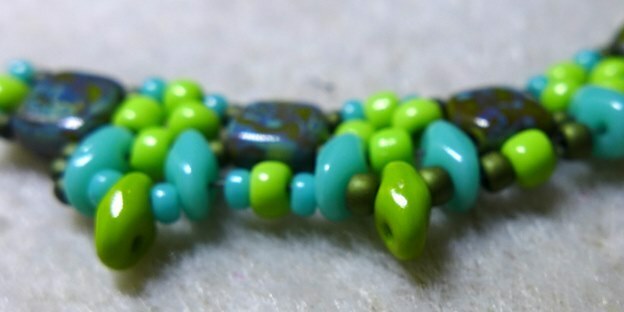 Picture 1 – Grouping the beads to get an idea of how they would look. 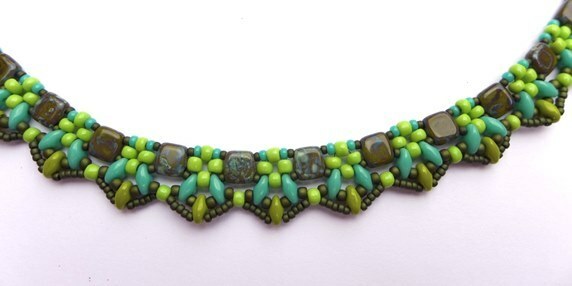 With only a small quantity of Opaque Turquoise SuperDuos I was planning to use just one of those per segment. Picture 2 – First row complete and sizing checked. Picture 3 – I had started working with the Opaque Olive SuperDuos (see right of photo), but I didn’t really like the way it was looking. I counted the Turquoise ones and there were 76 – just enough to do two per segment with a couple over, so I ripped it out and used the Opaque Turquoise ones instead. In Picture 4 I had started inserting the Opaque Olive SuperDuos with Opaque Turquoise 11/0s but this seemed a bit lacking. I completed two segments and then decided to try with Matt Olive 11/0s instead. I liked that much better, so ripped it out and started the row again. Picture 5 – The Pinnacle Necklace finished. Matt Olive 15/0s used in the last row. One of the things I learned from this project is that once you start working with the beads you have chosen it may not look as good as you thought originally and stringing a couple of segments with an alternative colour/bead can change the perspective. I think that using the Matt Olive made the SuperDuos “pop” where the Opaque Turquoise was a bit boring. 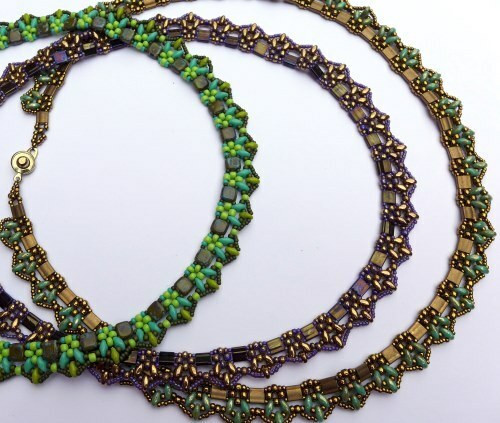 This project is easy enough for a beginner with stringing knowledge and makes a lovely delicate necklace for you, or for a gift. And how great of you to add the samples Thank You Anyway, I love everything I bought, and everything is as I expected or better!!! Thanks again, I’ll be back, very soon!! !